It’s December, it’s cold (for Arizona), and the Rattlesnake Solutions relocation team is still busy. Instead of picking up rattlesnakes from patios and porches, we’re pulling Western Diamondbacks from garages and sheds. Whenever this happens, a common comment pops up – “why are there still rattlesnakes out there? It’s Winter, I thought they were hibernating?” What is going on? The answer is easy enough – why aren’t rattlesnakes hibernating? (or brumating, as is more accurate, with a note on that later) They are, and the places we catch them are where they’re doing it. 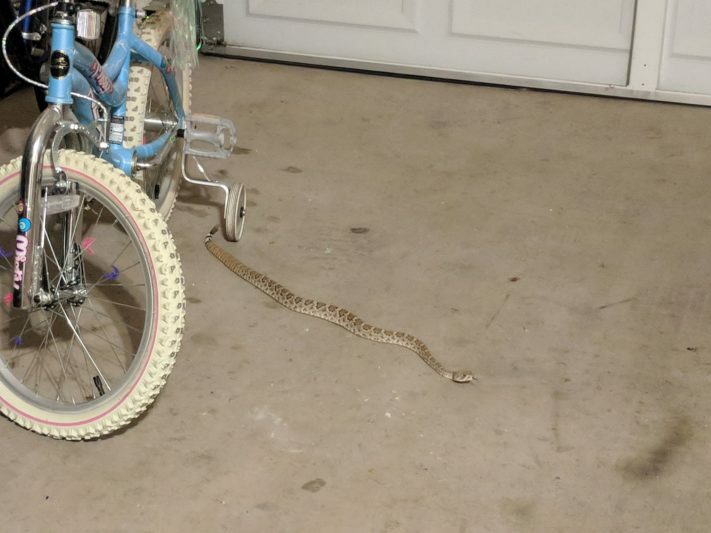 As we have covered in previous articles about just how and why rattlesnakes choose garages as prime den real estate, rattlesnakes in the warmer parts of Arizona tend to have quite a few options for a survivable winter refuge. 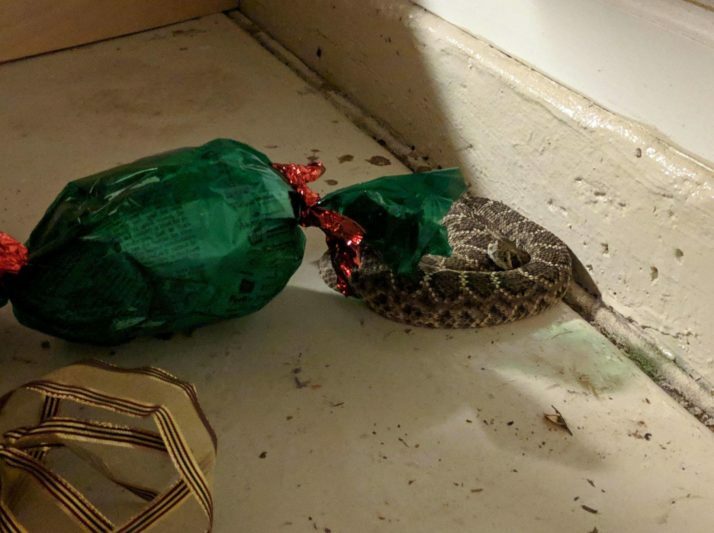 When a rattlesnake is found in a garage on a cold December day, it’s likely been there since October, and where it is found is where it was brumating. This is not the same as being active, being “awake”, or any situation where an imagined extension of rattlesnake activity has been extended because of a few warm days or any other reason. They’re not, they’re in, and that’s where you found them. As mentioned earlier, rattlesnakes don’t truly hibernate. Rather, they do something similar called brumation. This means they’re sleeping a lot and avoiding the cold, but if conditions are good for them, they may come sit at the entrance of their den and hang out or move around a bit. What conditions cause this to happen vary by species and location. Here in the Sonoran Desert, temperates can get chilly but not often dangerously cold, and moisture loss is a concern. They don’t necessarily choose sites that have a lot of sun exposure, or even avoid it altogether (Hamilton et al 2008). On some warm days, especially just before or after rain, or a bit of sun after a some winter sprinkles, rattlesnakes will often come to the surface to take advantage of it. That means that if you see a rattlesnake coiled in the backyard, it’s likely been in the area for quite awhile already, and is just coming out a short distance. There is no evidence to suggest this is happening, but somehow it’s still a news story each year. According to our call logs over the past decade, our observations, and other research, rattlesnakes are going into brumation (ingress) and coming out of it (egress) in about the same times as normal. That is, generally, in by the first of November, and out by the 15th of March. That means that the shoulder times around those dates are full of rattlesnakes moving around and traveling, so sightings may increase, even as general activity is considerably less than other times of year. This is when you should be keeping garages and gates closed. How can I be rattlesnake-safe this Winter? Is your home a rattlesnake den? How to stay rattlesnake-free this winter. Are rattlesnakes evolving to rattle less, or losing their rattles? Why February is the best time to have a snake fence installed.